We decided to spend winter in Turangi and take advantage of the year round fishing available in Lake Taupo and some of the local rivers; the mighty Tongariro being the most famous of them all. Although the number of fish and their size and condition had been in decline for several years, the fish already caught by anglers this winter season seemed to indicate a remarkable recovery and we were looking forward to being back. 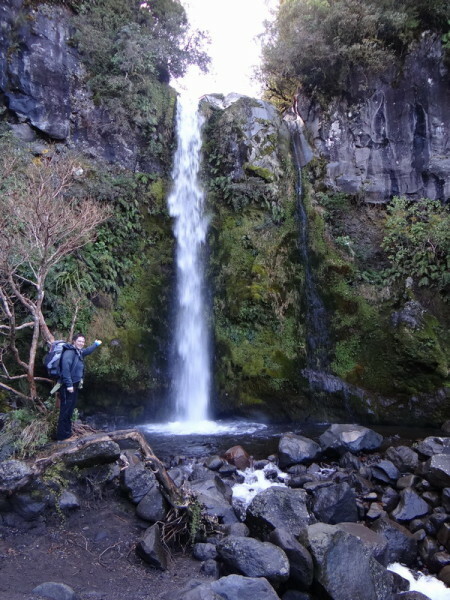 But before heading to Turangi, the west coast of the North Island with Mount Taranaki and Egmont National Park stood high on our bucket list. On all the previous trips to New Zealand, we missed out on this spectacular region and it was time to change that. We had seen Mt Taranaki from the top of its eastern neighbour, Mt Tongariro, but from up close it looked even more impressive. 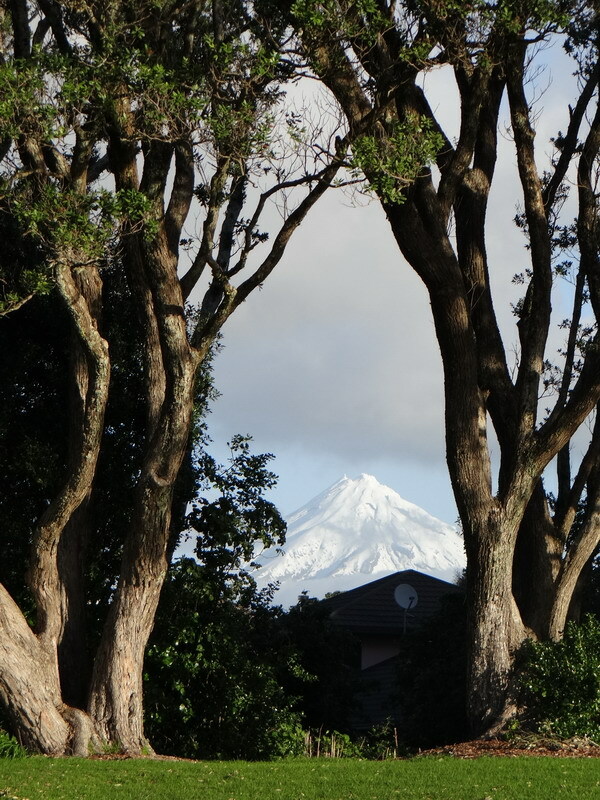 2’518m high Mt Taranaki/Mt Egmont is flanked by two smaller volcanoes and dominates the landscape with its distinctive shape. With the summit being just over 20km from the coast, the mountain offers unparalleled views out to sea and over fertile farmland. 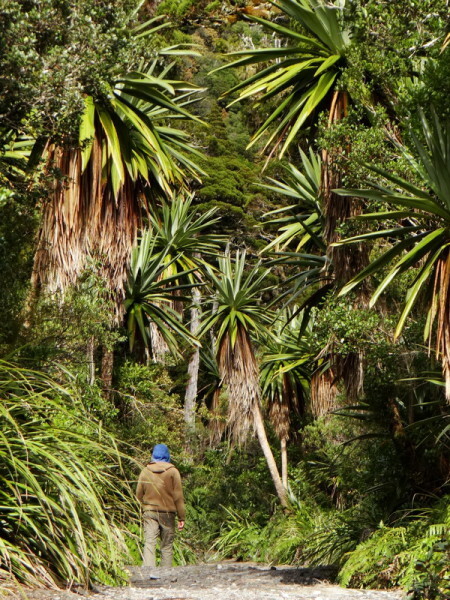 The slopes of Mt Taranaki display a unique mosaic of many different types of vegetation, from lush rainforests to tussock lands and alpine swamps. As early as 1900 Egmont National Park was established, covering around 33’500 hectares. 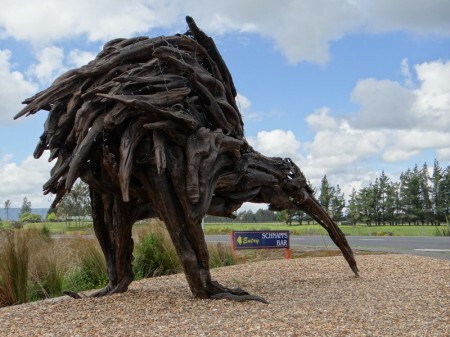 Today, the mountain features a visitor centre, several access roads and a great network of walking tracks. Taranaki is also an important dairy farming region and has attracted an unusually high number of settlers from Switzerland. May be the area reminds them of their home country? Mt Taranaki is an active volcano, research shows that the last major eruption took place in the middle of the 17th century; statistically Mt Taranaki has a major eruption every 500 years. 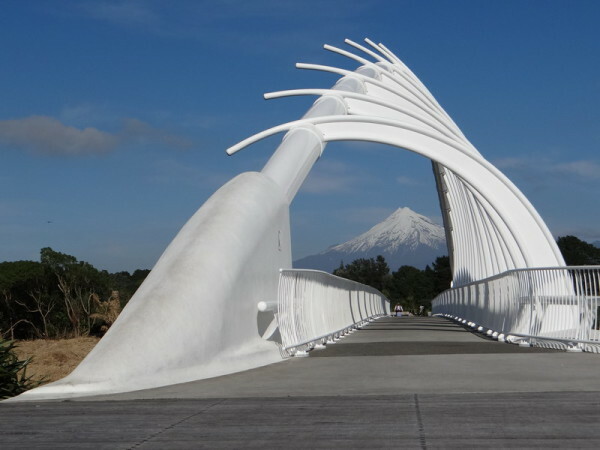 We based ourselves in New Plymouth, the major city of the region and with a population of just over 50’000 a very lively place. 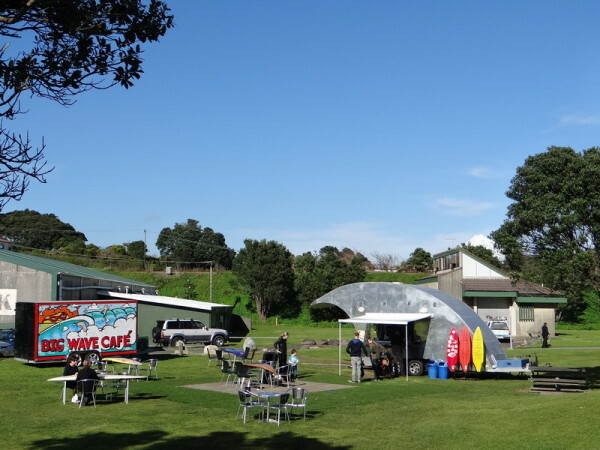 The area features some of New Zealand’s best surfing spots and if one is keen enough, it is possible to go skiing in the morning and surfing in the afternoon. We decided to take it easy and explored the costal walkway with its great beaches. 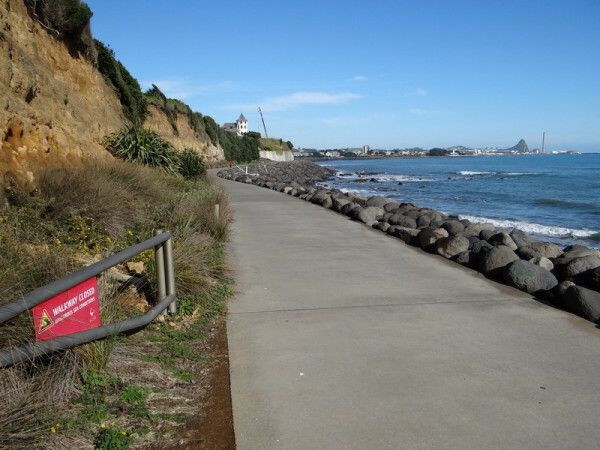 New Plymouth has upgraded its waterfront remarkably and pedestrians and cyclists have an excellent choice of designated tracks. 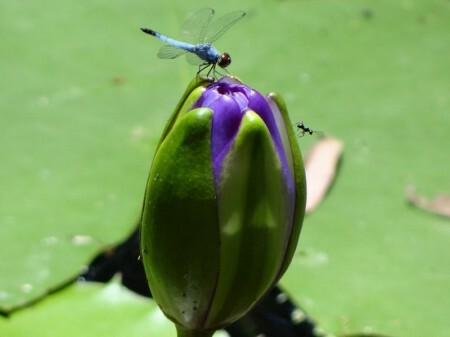 The city is also home to many beautiful parks and even with winter still in full swing, many plants were already blooming thanks to warm weather and a generally mild climate. And we walked some of the great tracks up the mountain of course, enjoying the stunning scenery and the unique flora. After 10 very pleasant and relaxing days, we left New Plymouth and headed east. 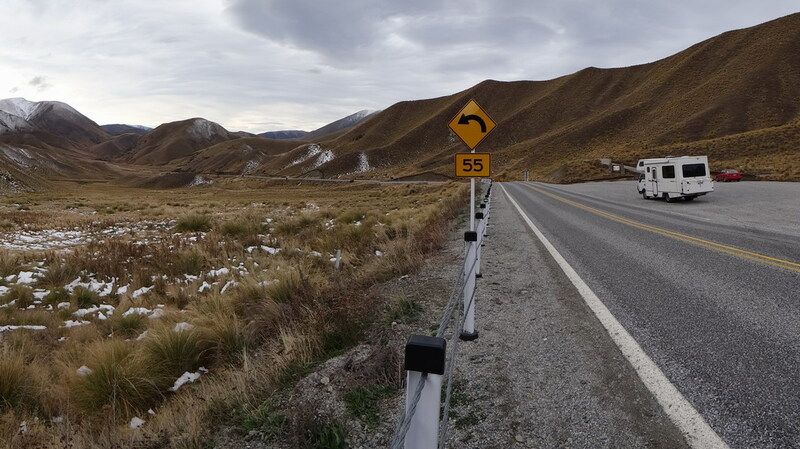 The Forgotten World Highway from Stratford to Taumarunui proved to be a very picturesque route indeed and we enjoyed the relaxed drive through steep hill country with small settlements and many historical features. 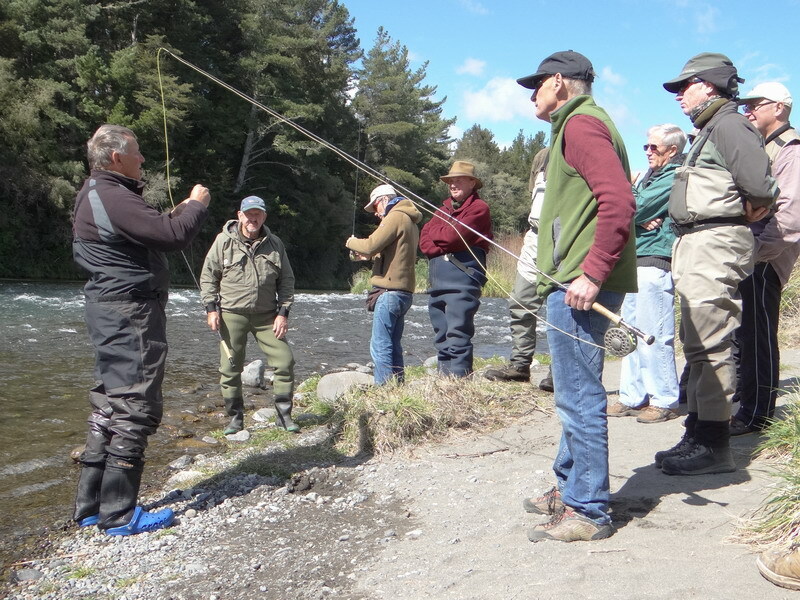 Although the Taranaki region has some amazing fishing for trout on offer, the rods stayed put over there and we were as keen as mustard to give it a go in Turangi. 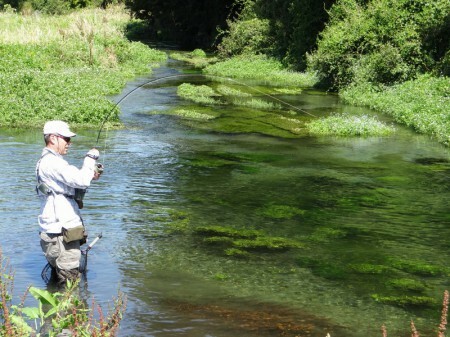 When we arrived, the rivers were running low and clear, usually not the best conditions for good runs of fish. But despite the lack of rain, the fishing improved a week or so after our arrival and the number and size of fish caught were remarkable. We have said it before, if one is seeking solitude and tranquility, fishing the Tongariro in winter is probably not going to be a good idea. Too many anglers are keen to catch one of the famous Taupo rainbow or brown trout and the river can get really crowded. 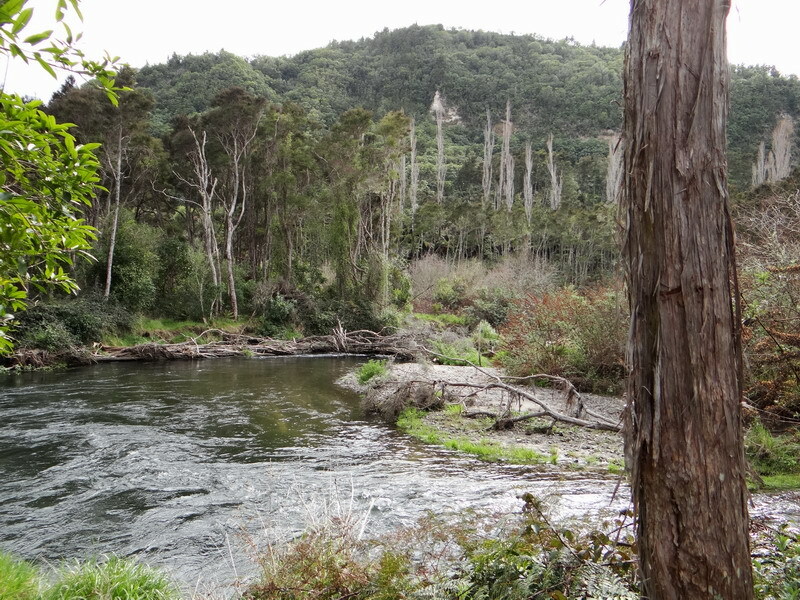 The smaller rivers north of Turangi are usually less frequented and we found a new favorite of ours. More of a stream than a river, it was an absolute pleasure to fish. 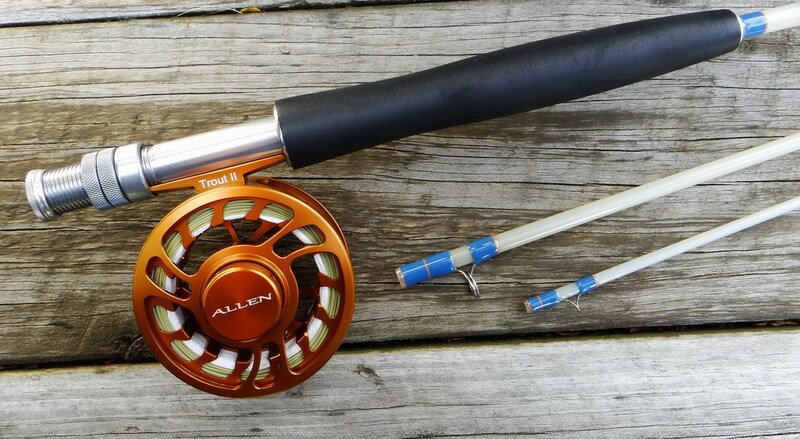 We spent many days along its banks and only twice did we encounter other anglers. 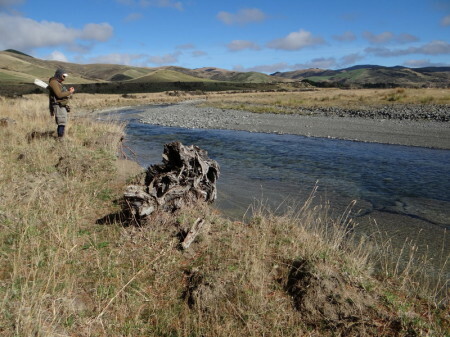 During the first weeks of our stay, the Taurango Taupo River and the Hinemaiaia River, two other personal favourites, did not hold a lot of fish due to a lack of rain. But after a spell of wet weather, the fish started to run up from the lake and we had exciting fishing. Both rivers are a trout’s paradise with deep pools, shallow riffles, long glides and heaps of drift wood and some impressive log jams. 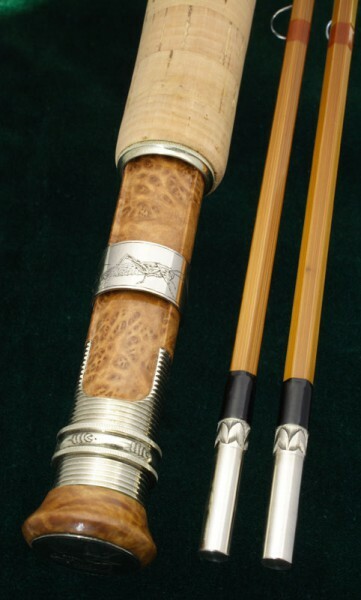 Many years ago in one of the fishing magazines, we read an article about a special cast, called the Tongariro Roll Cast. 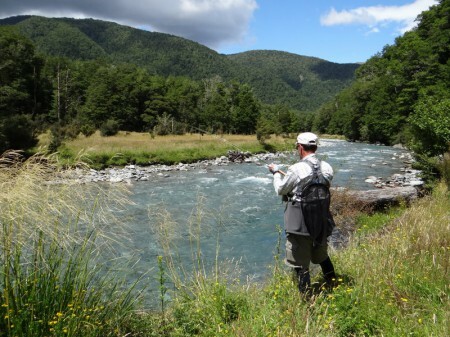 The article was written by Herb Spannagl, a passionate fly fisher with an intimate knowledge of the Tongariro River. When we heard that Herb was going to hold a casting clinic, we did not have to think twice and registered for the event straight away. Herb and two of his friends did a great job indeed teaching the cast to about 15 people with Béatrice being the only woman in the group. 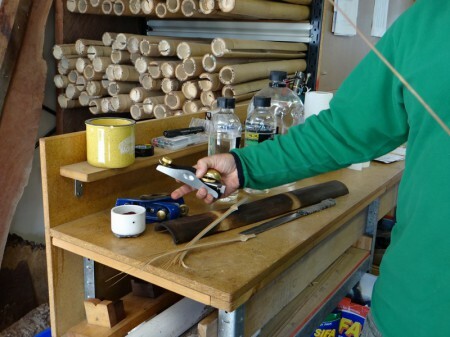 The Tongariro Roll Cast, like many other casts, seems easy to learn when performed by an expert, but things were looking a bit different when we tried to master it ourselves. Herb was an excellent teacher though and everyone made progress during the day. The two of us will have to practice a lot more to get it right, but mastering this cast is worth all the effort; the Tongariro Roll Cast is such an amazing tool when using heavy nymphs. It is a lot less tiring then a regular overhead cast, it’s faster and it eliminates any danger of the heavy flies hitting the caster. And, like any other roll cast, it requires very little room behind the caster. While in Turangi, we were looking after the house of friends who spent 4 weeks overseas. 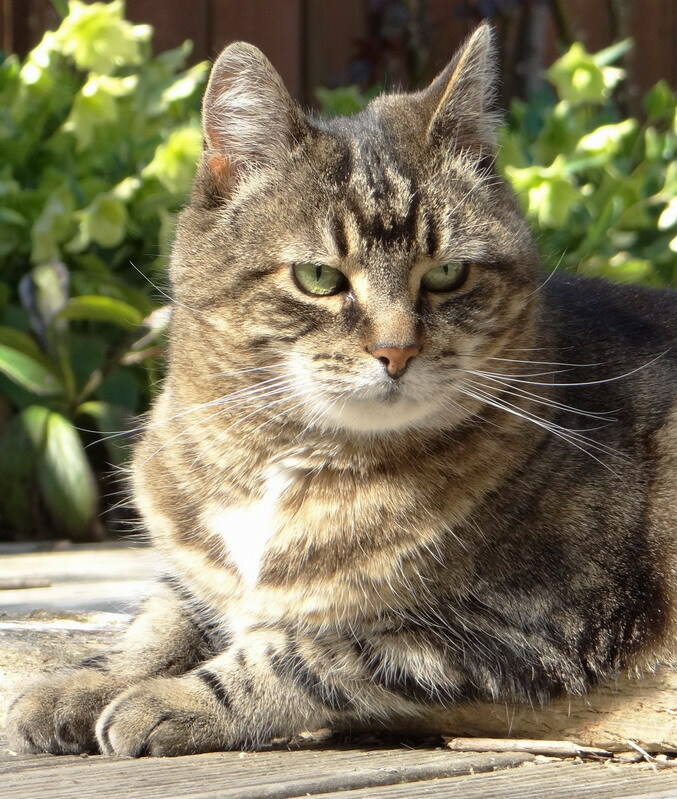 It was quite a change to have a big house all to ourselves with a beautiful garden full of spring flowers and even our very own cat. Although it was for a limited time only, we thoroughly enjoyed the feeling. Time went by far too quickly and we had to think about the last two months of our stay – after almost four years of travelling, our plane back to Switzerland was going to leave at the beginning of December. After some serious thinking and debating we came to the conclusion, that we should travel south again and spend most of October and November on the South Island before heading back up north. 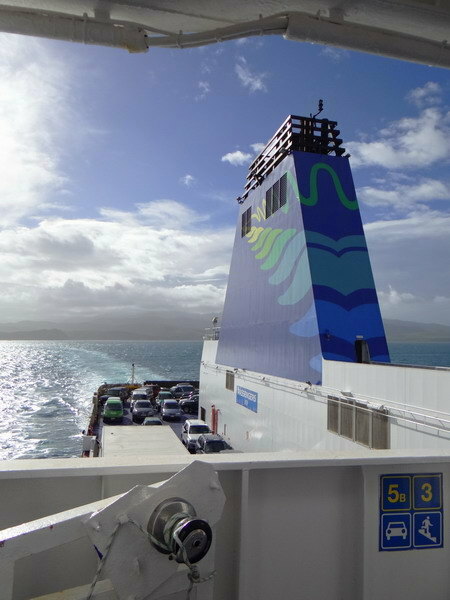 We left Turangi and caught a ferry across Cook Strait the next day. The weather forecast predicted strong winds and we feared the worst, but the crossing was calm and no one got sea sick. 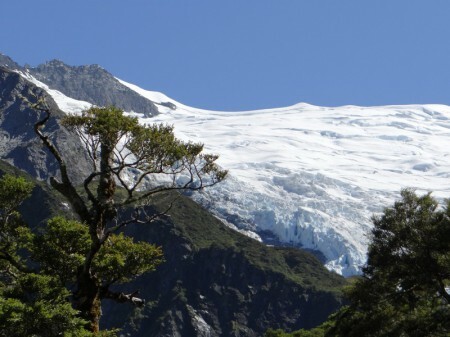 Our intention was to travel down the West Coast and over Haast Pass to Mossburn in Southland as soon as possible with just 3 nights stopover along the way. While in Reefton, we checked the road conditions to make sure everything was fine. 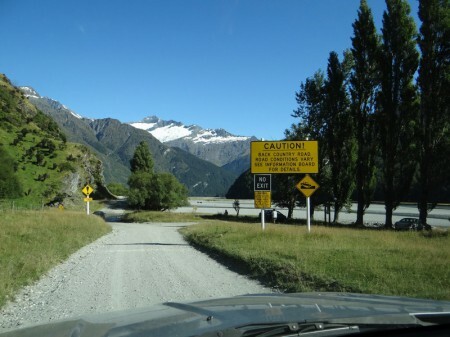 Unfortunately, the highway over Haast Pass was closed again, due to a massive landslide and rock slips caused by heavy rain about two weeks earlier. A camper van got caught up in the mayhem at the time and a young couple from overseas got killed. Because of the size of the slip, it was only possible to open the road temporarily and especially after rain, the road had to be closed again. 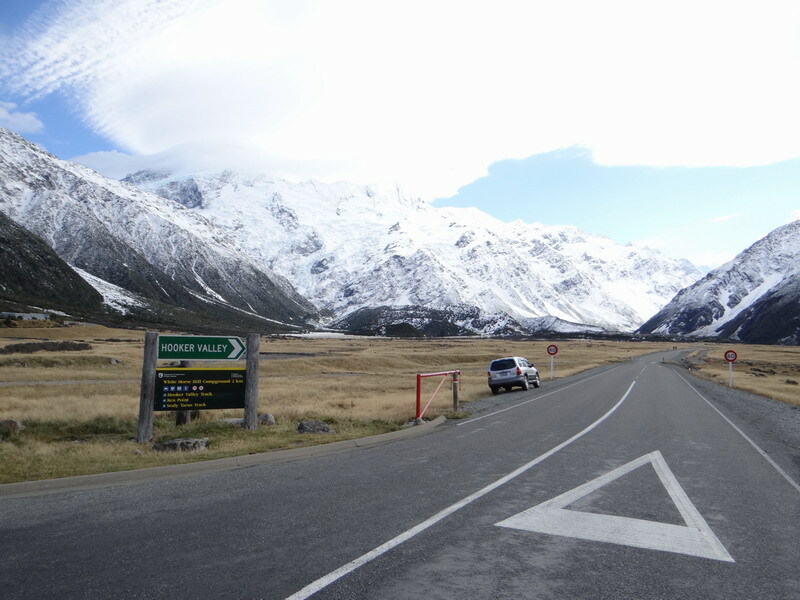 Arthur’s pass and down the East Coast. After many years as passionate fly fishers, we thought there is not much that can surprise us anymore in regard of fly fishing equipment. As it turned out, we could not have been further from the truth. 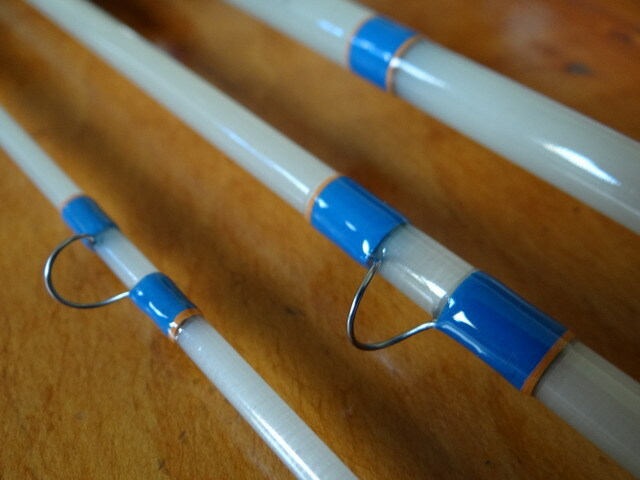 Friends of ours had been raving about their modern fiberglass rods for quite a while, but as dedicated fast action rod junkies, we didn’t really care. 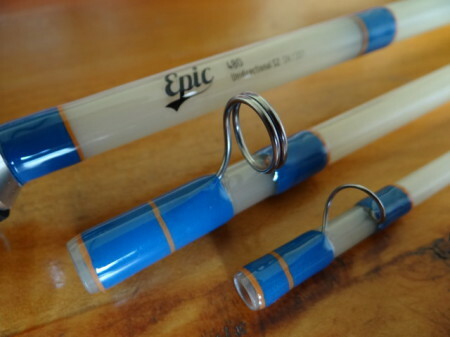 When we came across Carl McNeil’s already legendary NZ made Epic fiberglass blanks a while ago though, we decided to give it a go. All that was needed was a rod builder. 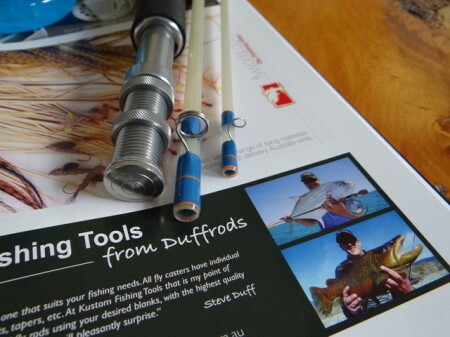 Then we remembered having seen Steve Duff’s Kustom Fishing Tools add in Flylife magazine many times. www.duffrods.com.au And we had also noticed that he uses EVA grips on his high end custom made fly rods, a feature the new rod just had to have. 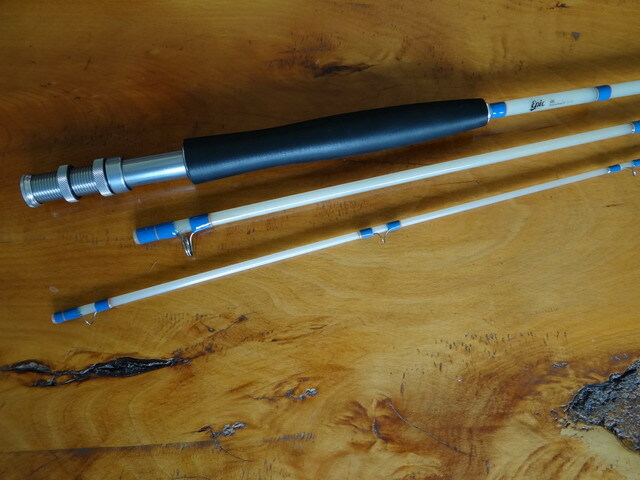 Having put together a list with the hardware and the finish we wanted on our rod, we sent Steve an e-mail and he got started. 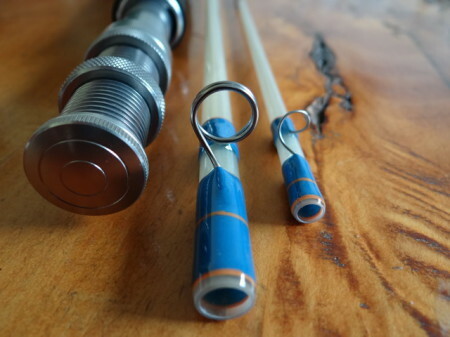 We couldn’t wait to receiving the finished rod, to cast it and to fish it of course. And when it finally arrived, it was like Christmas and Queen’s Birthday on the same day. And the verdict: Woow! There is life before death after all. We have not caught many fish on our Duff Epic yet, but with the weather getting warmer, it should only be a matter of time until its fish fighting abilities are seriously put to the test. Will keep you posted! It has been a long time without any news; we sincerely apologize to everyone and promise to do better. So, let’s get cracking, we have some catching up to do. Previous memorable stays and the love for the far south of New Zealand made us want to go back to Te Anau. And once more we stayed in the shearer’s quarter on Mt Prospect Station, about 25km out of town. We had been looking forward to catching up with our hosts, Rachel and Grant and their 10 year old daughter Ellie for quite a while. Being with them always makes for an interesting time and we take part in the daily station life. Rachel and Grant had an exchange student, a young woman from Thailand, living with them for a year. To our surprise, Luksanaree, the 17 year old student, fell in love with the area and everything else. We expected her to be homesick, being on her own, surrounded by a very different culture, unfamiliar food and a much cooler climate. While we stayed there, Luksanaree had just 6 more weeks to go and was very unhappy that her time in New Zealand had come to an end already. 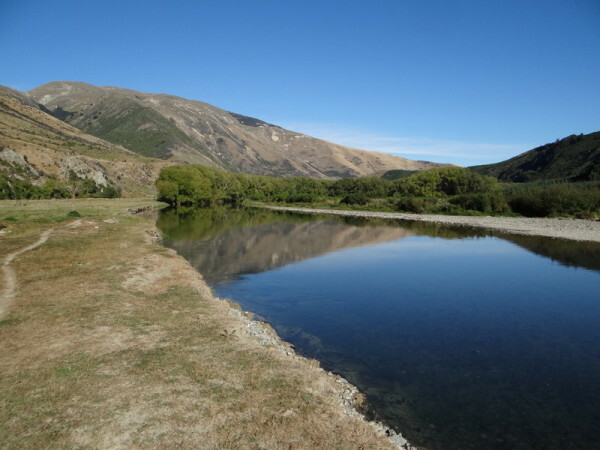 Even around Te Anau, usually blessed with a very high annual rain fall, the summer 2012/2013 was exceptionally dry and many rivers were running dangerously low. The fishing proofed to be very good though and we explored a lot of new waters. The weather was good and reasonably warm most of the time, although in early March, we had the odd frosty night already. Big dry fly patterns were still working a treat apart from a few occasions, when fish were being very particular and refusing to eat anything but very small flies. After 3 weeks in Te Anau, we travelled just 60km to the East and stayed in Mossburn for another 9 weeks. Initially, our plan was to be in Mossburn for only 3 weeks, but the abundance of rivers on offer close by made us stay till the beginning of May. In the second half of March, it got a lot cooler and the fishing changed remarkably. 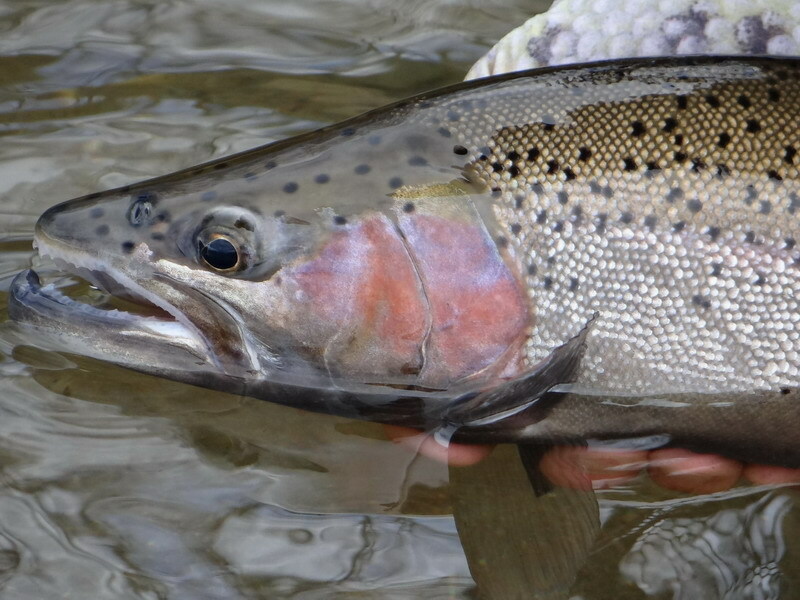 We still used mainly dry flies, but more and more often the fish would refuse any pattern that did not match the naturals available on that particular day. 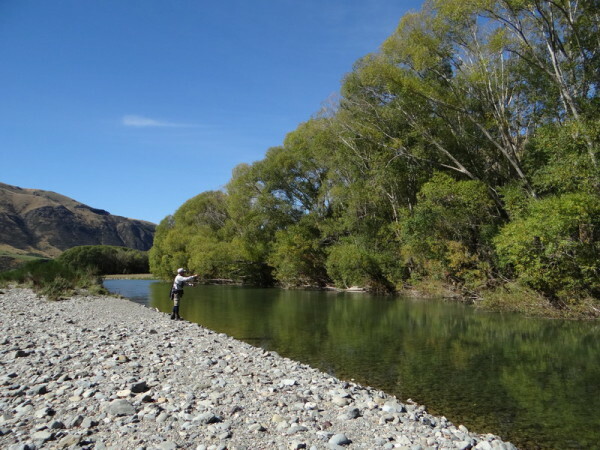 Especially in the afternoon of overcast days, we experienced prolific mayfly hatches on the Mataura and the Aparima rivers. It took us a while to get it right, but in the end, #16 and 18 Dad’s Favorite, Adam’s and similar patterns did the trick. 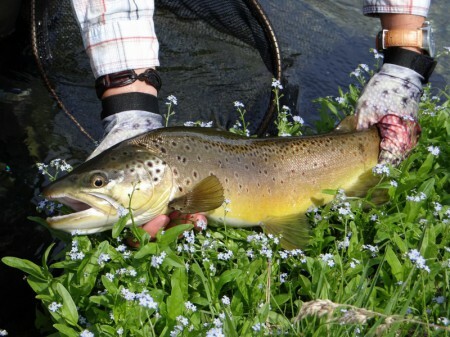 For several weeks until about mid of April, the fish – mostly brown trout – were at times voraciously feeding on willow grubs in the heavily willow lined parts of the upper Mataura. Big fish could be seen cruising in the long slow glides, gorging themselves on those tiny morsels and ignoring all our offerings. 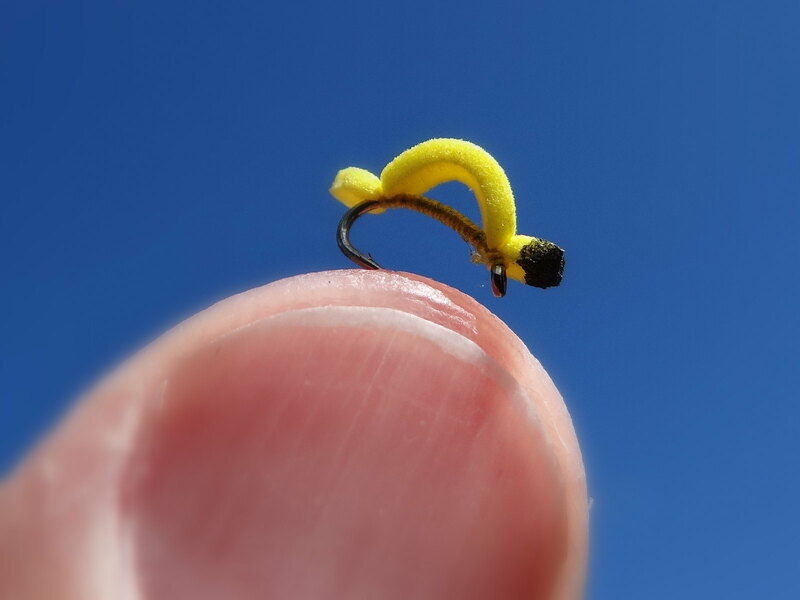 It was amazing to witness how far from its spot a trout would move to get a grub, its eyesight obviously excellent indeed. 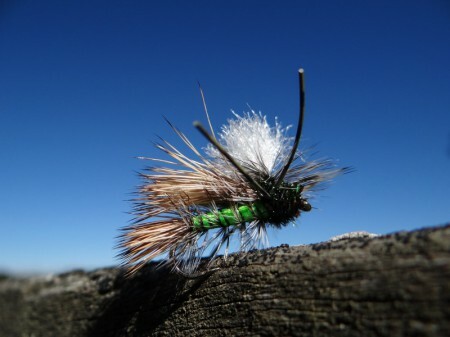 We only started catching fish on a regular basis again, after we had bought a couple of foam willow grub imitations from Stu’s fly shop in Athol. These very small flies float in the surface film, are incredibly hard to see and we missed many takes. We loved the challenging fishing though and had a great time. April was much colder than March with many frosty nights and cold, clear days. The poplar and willow leaves turned a striking yellow and started to fall of the trees. We loved the little cottage we stayed in very much and had the open fireplace running every night. The trout fishing season closed end of April and we finally left Mossburn at the beginning of May. We drove back up north through Queenstown and Cromwell and over Lindis Pass into the Mackenzie Basin, Twizel becoming our base camp for the next 10 days. The mountains all around had just received a decent dusting of snow and looked amazing. 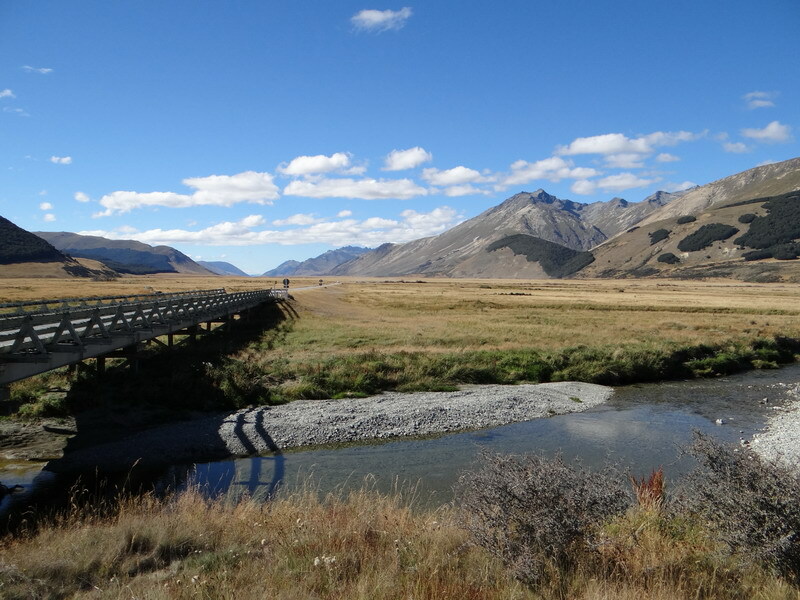 The Mackenzie country – being very dry and showing a unique flora and fauna – has always been another favorite of ours. It has changed quite a bit since our last visit more than 10 years ago though and more and more huge irrigation systems are littering the landscape, dotting the otherwise brown and grey scenery with alien looking, indecent lush green freckles. 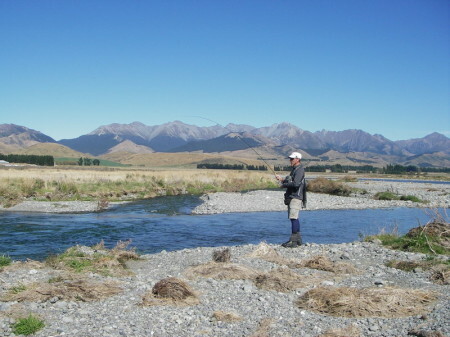 After two weeks without fishing, we had our first spell of light withdrawal symptoms and decided to give it a go and fish the man made canals around Twizel. Not a pretty sight by any means, but home to brown and rainbow trout and also to salmon of gigantic proportions, the latter escapees from several salmon farms. 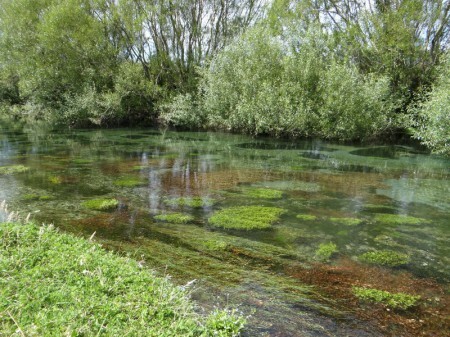 Some of the fish grow very big indeed and every year trout and salmon over 20 lb get caught. Those monsters live under the salmon cages, feeding on the pellets that fall through the mesh. We did not get such a giant, but we managed to catch some good fish stalking the edges and casting to cruising brown trout. We also fished with lures and hooked many salmon. Despite the fact, that most of them had damaged tails due to having lived in a cage at some stage, they had beautiful orange flesh and tasted great. Several months without being in a major city had us looking forward to visiting a museum or an art gallery and may be go to the movies. This and the need for a computer technician made us choose Christchurch as our next destination. 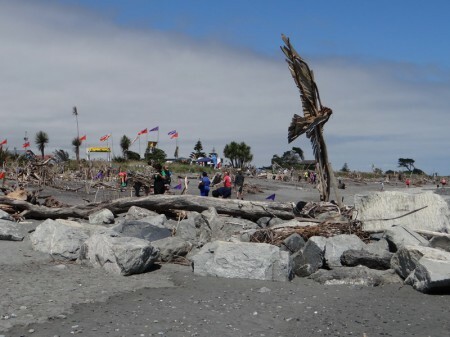 We have been to the largest city on the South Island several times before, but this was going to be our first visit after the big earthquake more than two years ago. 185 people died when the magnitude 6.3 earthquake hit on Tuesday, the 22nd of February 2011 at 12:51pm. More than 10’000 homes became uninhabitable and by April 2013, the total estimated costs of damage had reached NZ$ 40 billion. We had watched the news at the time and saw the devastation caused by the disaster, but seeing the city ourselves two years later, the damage seemed even worse. Just after the quake, many buildings were still standing. 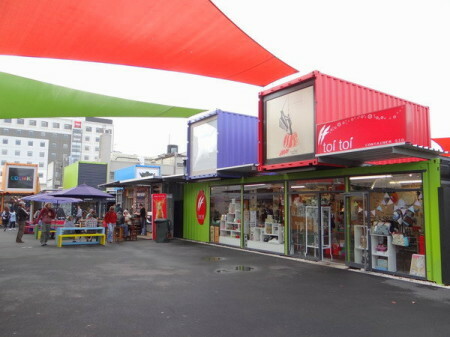 Now, with most of the unsafe and damaged structures removed, the Christchurch CBD looked very deserted and alien indeed. And there were still more buildings to come down. Although a lot of machinery was on site, no new buildings had been erected yet. Many of the streets were closed and we walked a lot instead of taking the car. On previous trips, we loved to visit the arts centre, housed in the old university and the Saturday arts and crafts market. But this time, a huge fenced off building site was all we came across. The stone buildings of the old university have been severely damaged, but they will all be repaired and rebuilt within the next two years. 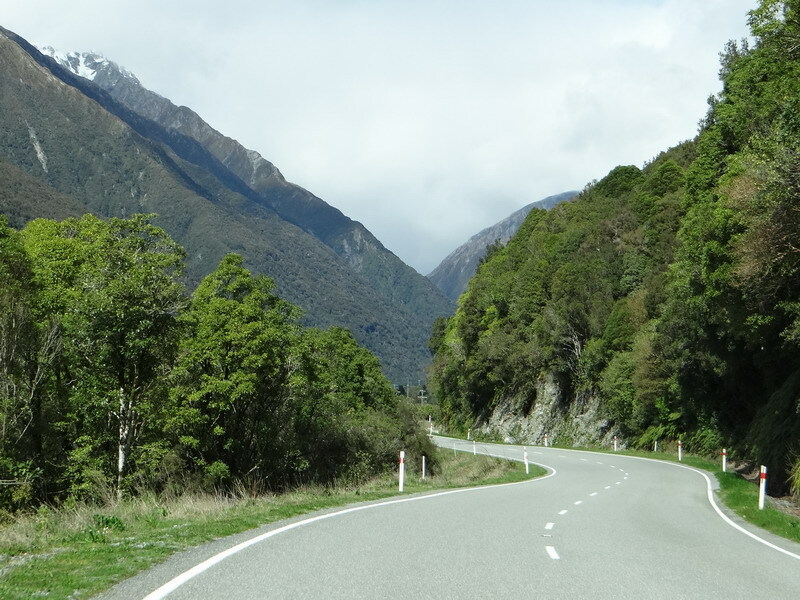 With our hunger for culture satisfied, we left Christchurch and travelled west to Reefton, where we stayed a couple of days and then on to Motueka in Tasman Bay, just west of Nelson. It was raining cats and dogs while we were driving to Motueka and we had to take a detour, because some of the roads in the Tasman District were closed due to flooding and landslides. The weather improved during our stay though and we had a great time catching up with our friends, doing some great walks and a bit of sightseeing as well. While crossing the Tasman, mixed thoughts were going through our minds. Saying goodbye to Australia and all our friends there made us sad and yet we were looking forward to being back in New Zealand and to seeing our Kiwi friends again. And there is another thing: Australia is a vast, immensely diverse country and we love all of it very much indeed. One has to be on the lookout for many of the native creatures though, from snakes to spiders, from jelly fish to crocodiles. 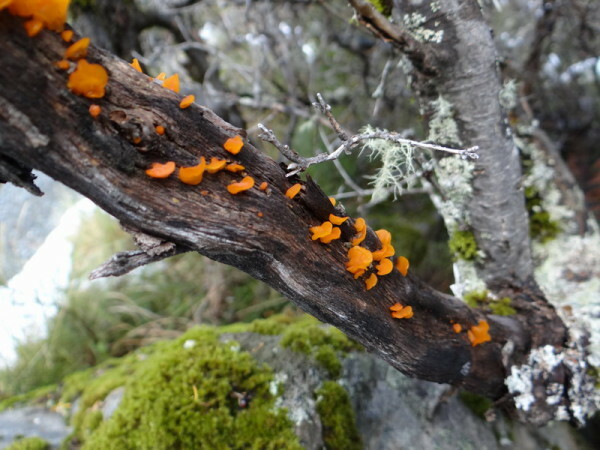 New Zealand on the other hand, although much smaller, features great diversity as well, with the added bonus of being free of any poisonous or potentially deadly wildlife. A country where sandflies are about the nastiest thing you might encounter while outdoors is truly a traveler’s paradise. What a pleasure to be able to walk barefoot through dense undergrowth or to take a riverside nap on the grassy banks after having caught a beautiful fish. On the plane we met Iris, a young German traveler, who was going to meet with friends from home later on after having spent a couple of months on her own in Australia. It surprised us time and again how independent and self-confident most young people are and we admire them a lot for their courage. 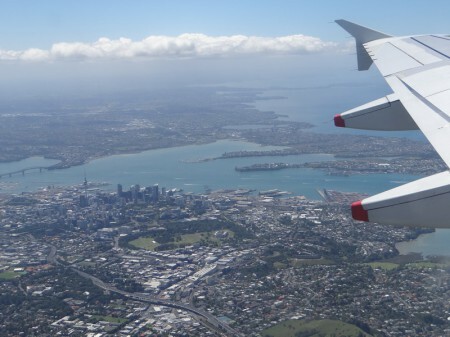 We had arranged a rental car ready for pick up at the Auckland airport for a couple of days. Our own car had been in storage in Hawke’s Bay at the house of friends for almost two years and we wondered if it would be okay and running. We should not have worried, our friend Steve had looked after our Mazda very well and even replaced the battery at some stage. The only unpleasant surprise were tooth marks on several rubber parts in the engine bay, caused by a rat that had called the garage home for a while. 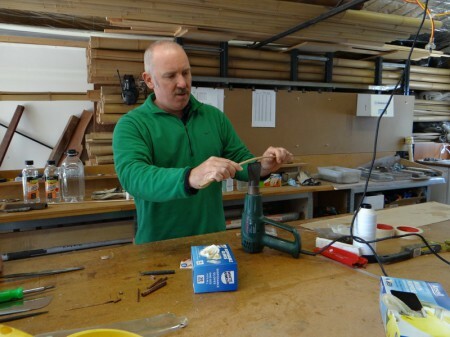 The cheeky rodent chewed away a tube on the radiator, but Steve had discovered the leak months ago and fitted a replacement part. So getting a warrant of fitness and renew the car’s license was a walk in the park and after a few days we were ready to get serious. 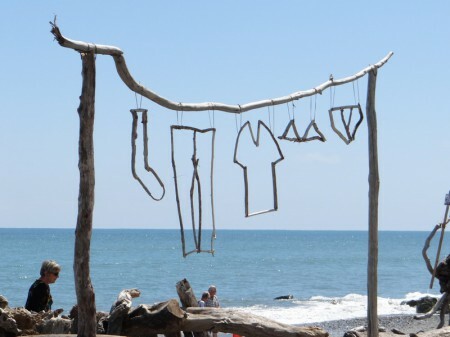 Our aim was to travel to the South Island as soon as possible and to spend most of the summer down south. 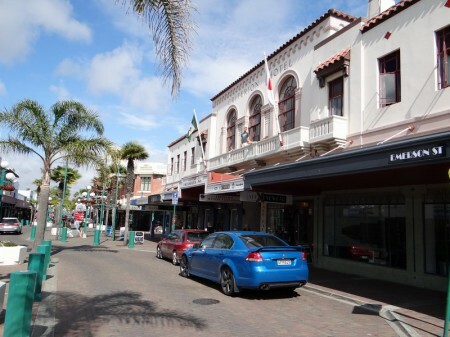 While driving from Auckland to Hawke’s Bay, we stopped in Hamilton and applied for a 12 months visitor visa. The visa arrived several weeks later and allows us to stay in the country until the 8th of December 2013. Friends from Switzerland were coming over to spend Christmas and New Year in New Zealand and we were looking forward to meeting them in Turangi and to catching up after almost 3 years, before crossing Cook Strait by ferry and spending New Year in Motueka. 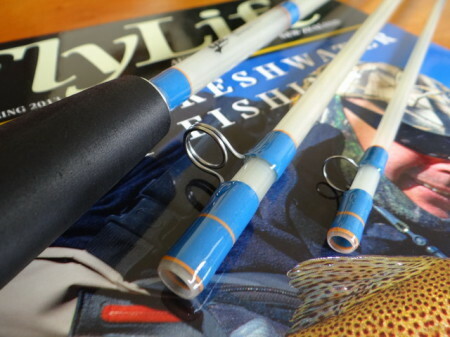 We had a wonderful festive season in the company of good friends, but the lure of summer fishing for brown trout was drawing us further south. May be it is a sign of getting older, but we keep going back to places we already know and are less tempted to explore new places. Our first serious outing with a fishing rod on this trip was Reefton (see also entry Reefton Gold from January 2011). Reefton had experienced some very wet weather with heavy downpours just a week before, but when we arrived, the flows were almost back to normal and the rivers were running clear again. Debris and serious damage could still be seen in many places though. The railway bridge crossing Larry’s Creek had partly been washed away and frantic repairs were going on. Many river and creek beds were full of uprooted trees and drift wood with log jams as high as a house. Further down the West Coast, Harihari was hit even worse and the raging torrents of the Wanganui River just north of town had washed away parts of the highway bridge and caused a lot of trouble. For about 10 days, farmers had to throw away the milk because they couldn’t get it to the dairy and supplies for the townships along the coast were running low. 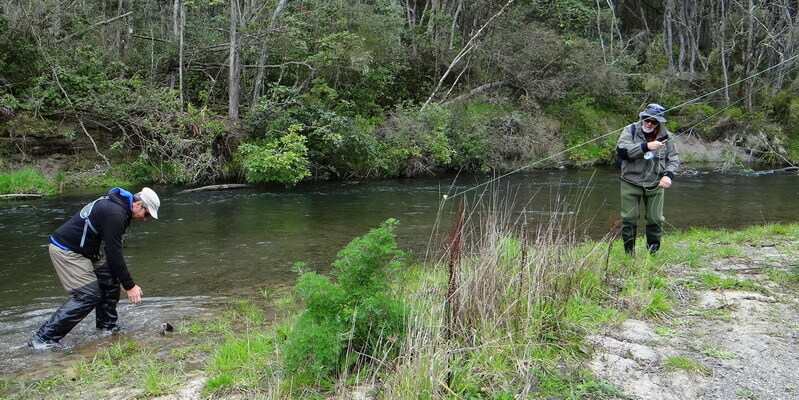 In Reefton, the weather improved a lot and the fishing was very good. 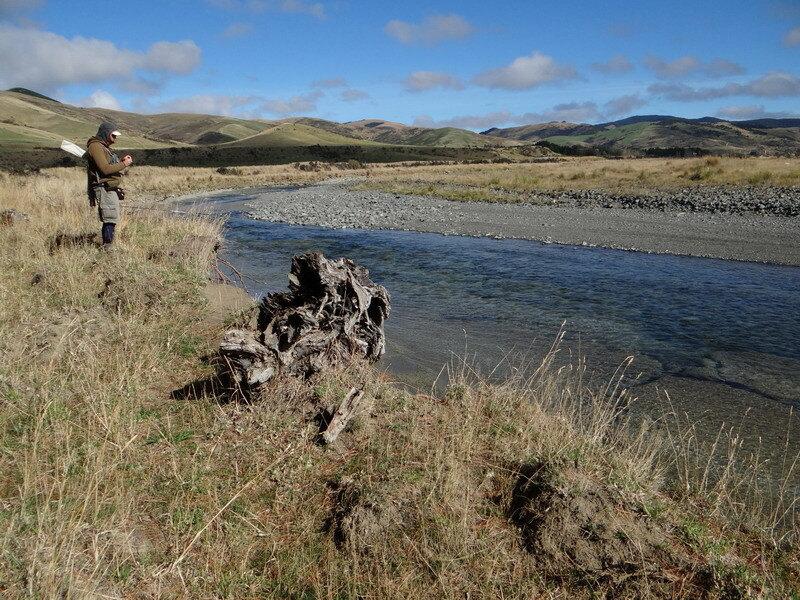 We visited old favorites and also explored some new rivers like the Robinson and the Little Grey and enjoyed fly fishing for trout very much indeed after an almost two year break. Our little trout sticks – we fished 4 and 5 weight rods – felt feather light in comparison to the 9 and 10 weight rods we had used over in Australia. 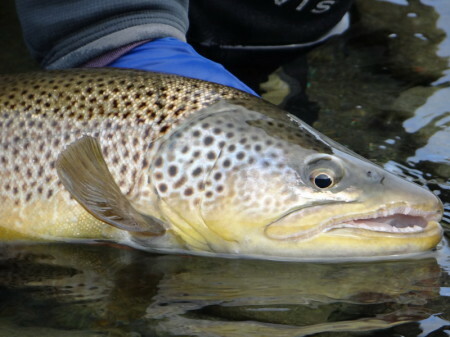 Despite the weather being on the cooler side for January, the fish were rising enthusiastically to our dry flies. 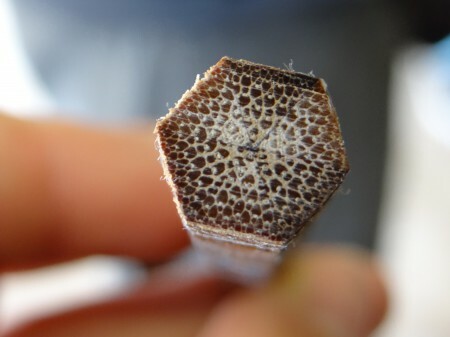 Big terrestrial patterns in sizes 8 and 10 worked very well most of the time. The sight of a decent brown trout sticking half of its impressive head out of the water to engulf a fly in slow motion is something that never ceases to get us excited. It was not all about fishing though and we walked many of the numerous tracks in the area; a lot of them leading to remnants of gold mining. Even though the mines around Reefton were closer to a town and major roads than many of the remote gold fields in Australia, the hardship the miners and their families had to endure in days gone by is still difficult to imagine. Being out there where it all happened and reading accounts of the time made history come very much alive. 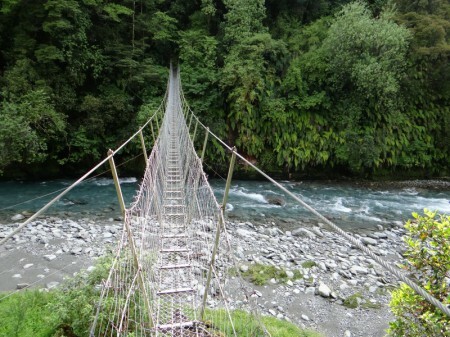 “Bridge over Wanganui repaired”, the newspapers announced at some stage and we were able to move on to Harihari. On the way through we paid our friends Grace and Brent in Hokitika a visit and were glad to find them well and happy and as busy as bees. They had established a thriving vegetable garden behind their house and we did not leave without some homemade goodies and Brent’s expert advice for some more fishing hot spots. 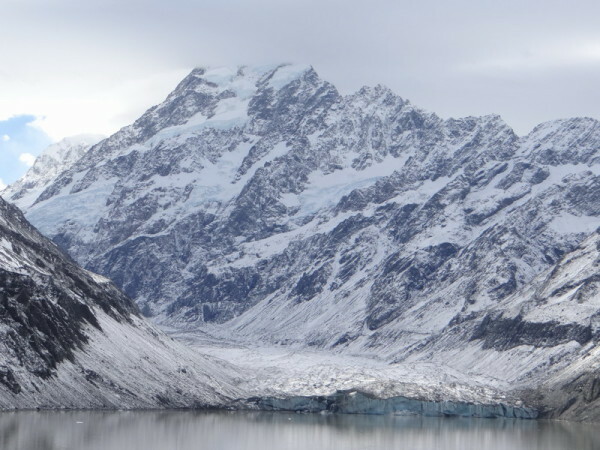 Once again we spent our time on the West Coast fishing magical spring creeks, visiting the glaciers and walking on remote and untouched beaches. After 10 days, when the weather forecast predicted heavy rain, we decided to leave the coast and move on to Wanaka. It was pouring down when we left Harihari and the drive south was quite spectacular. The coast was shrouded in low hanging clouds and mist and when we turned away from the sea and climbed up Haast Pass, water was gushing down the mountain sides everywhere and all the waterfalls were at their best. Wanaka, nestled on Lake Wanaka’s Roys Bay, is situated in one of the most beautiful parts of New Zealand. The town has become a popular holiday destination for the rich and famous and the prices for food and services are accordingly. And yet Wanaka is still a great place to be and not as busy and loud as Queenstown. We decided to take a break from fishing and concentrate on the countless walks and tracks. 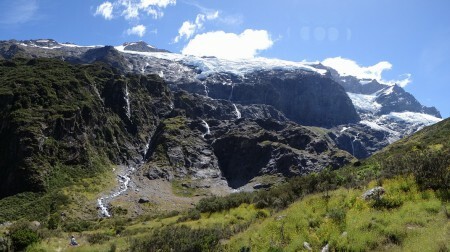 Our last attempt to walk to Rob Roy Glacier was not successful. It started raining cats and dogs while we were about half way up the track and we had to turn back. 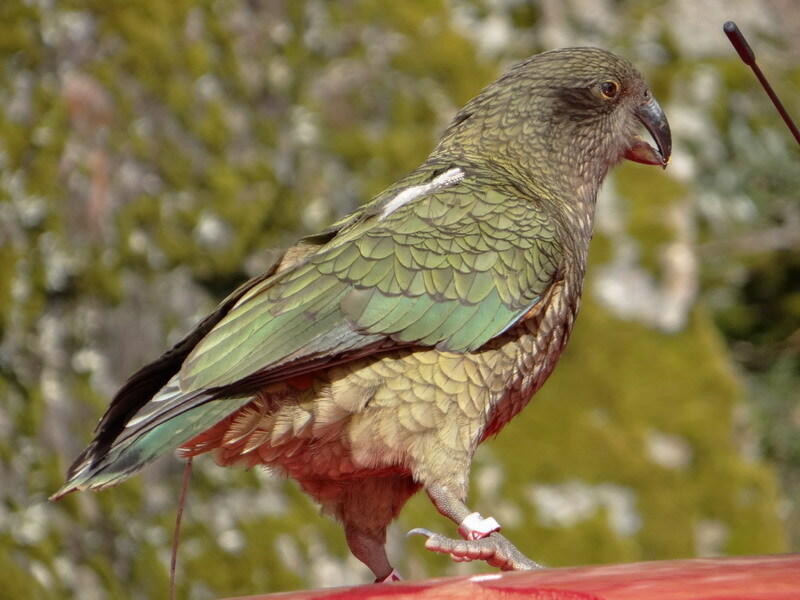 This time, the weather was great and after two hours of walking the brilliant white and blue ice of the glacier glinted in the sun under a bright blue sky and we could see and hear keas playing around high above us. 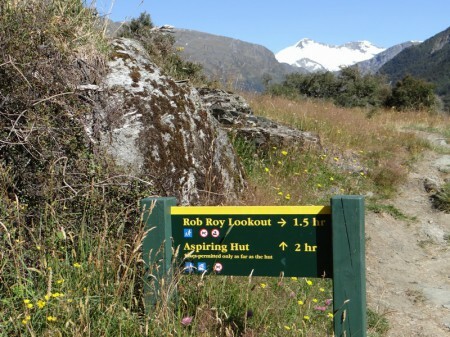 The very next day we took on Roys Peak. We had climbed the mountain before, but the 1200m ascent seemed to have become even steeper since our previous visit two years ago and when we reached the summit at 1’578m above sea level, we were both pretty spent. The view on this cloudless, sunny day was breathtaking though and lunch never tasted better than on top of the world. 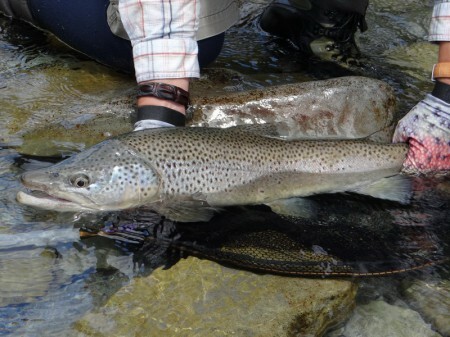 Thanks to many great rivers and lakes in close proximity, Wanaka is a paradise for any fly fishing addict and home to several outstanding fishing guides. Derek Grzelewski, passionate fly fisher, writer and photographer, also lives here. We had read his articles in Flylife magazine and had seen reviews of his first book “The Trout Diaries”. We got a signed copy and enjoyed the book very much indeed. Derek’s newest book “Trout Bohemia” will be published later in 2013 and we are already looking forward to another great read. He runs a website with podcasts and a lot more exciting stuff. Derek Grzelewski and his Trout Diaries. Despite the fact that we’ve had some pretty wet weather where ever we went, many parts of New Zealand were experiencing the worst drought in more than 70 years. Many farmers had to sell or kill a lot of their animals due to a lack of green pasture and milk production dropped significantly. Or so it seems, and yet it is true: after almost 20 months of travelling our time in Australia has come to an end. We have sold our car in Cooktown and the boat in Cairns and made our way back from Cairns to Sydney in 5 days, returning one of our friends’ rental cars which had been dropped off in Cairns by customers. It all worked out exceptionally well and we were looking forward to spending a few days in Canberra to catch up with dear friends before flying over to Auckland. 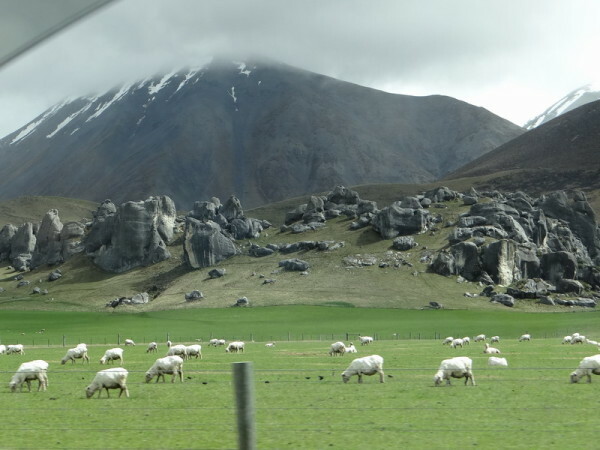 We decided to stay in New Zealand for some time before we eventually have to return to Switzerland; the money we got for our Troopy and the boat being our travel funds. While in Cairns, preparing our car for its new owner, a total solar eclipse happened and the entire city was going crazy. Far North Queensland- the best place on earth to see the eclipse in all its beauty – expected thousands of spectators from all over the world and the prices for accommodation from a basic tent site to flashy hotel rooms went through the roof; everyone wanted as big a piece of the cake as possible. The days leading to nature’s big event were cloudy and everyone was closely following the weather forecast. 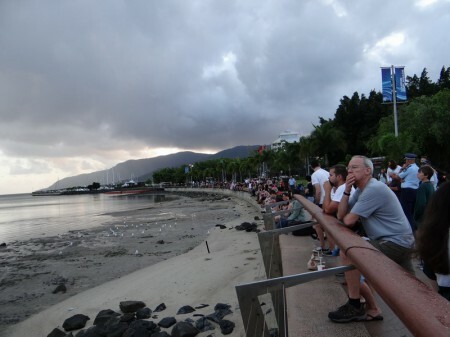 In Cairns, the moon was to cover the sun fully at about 6.40am and clouds were predicted. We decided to stay in the city though and watch the whole thing with thousands of fellow onlookers from the Esplanade. The moment of truth came closer and closer and so did the clouds. At 6.40am the sun was completely out of view, but what was minutes ago a bright, partly sunny morning turned into dusk and then it got almost dark. An eerie silence took hold and even the birds went quiet. Easy to imagine that hundreds of years ago people watching such an occurrence must have had all sorts of thoughts and fears. Within minutes it got brighter again and to our delight, the clouds moved on and we were able to see the moon still partly covering the sun at last. We had not seen our friends in Canberra for many years and it was wonderful to find them all happy and well. After having spent such a long time in Far North Queensland, Australia’s capital city and its surroundings seemed almost alien. The rolling hills, the mountains in the distance and the city with so many museums and galleries and a vast array of cultural activities drew us in though and we enjoyed ourselves very much indeed. Our friends went out of their way to make sure we had a good time and we felt like family. We spent one day out in the countryside at their bach and enjoyed fly fishing for trout for the first time in almost two years. What a difference to the fishing back home and in New Zealand. 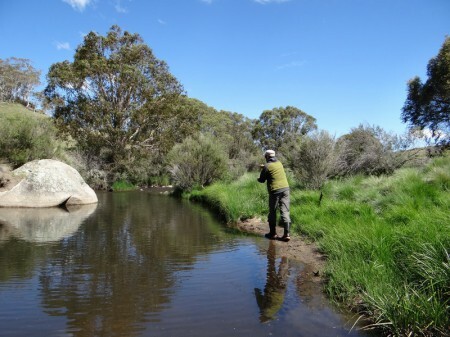 While fishing a delightful little creek, a Platypus searched the bottom of a pool for a yummy morsel and a big Brown Snake crossed our path, making us appreciate the gumboots we were wearing. Wombat burrows so big, an adult could easily fit inside, had to be avoided while sneaking along the banks. 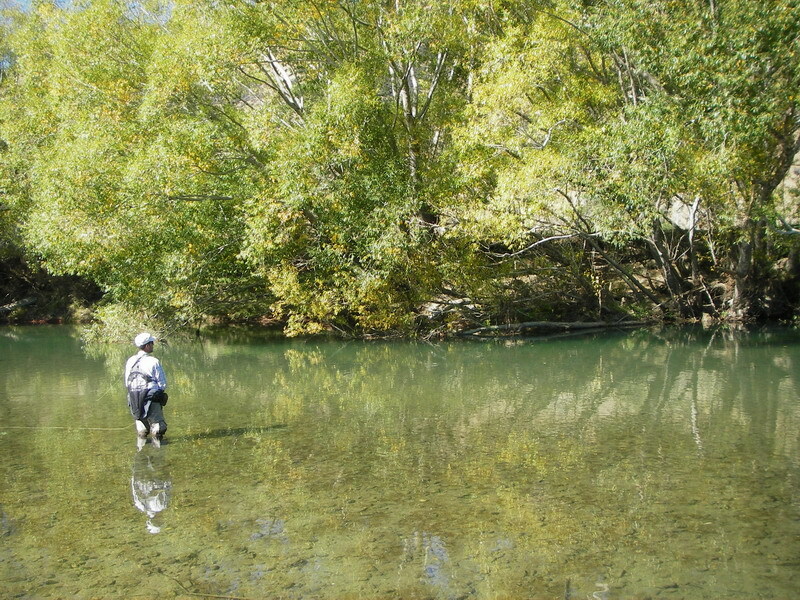 That day, the trout seemed to be even more elusive than usual and we – Béatrice that is – managed to catch just one fish. 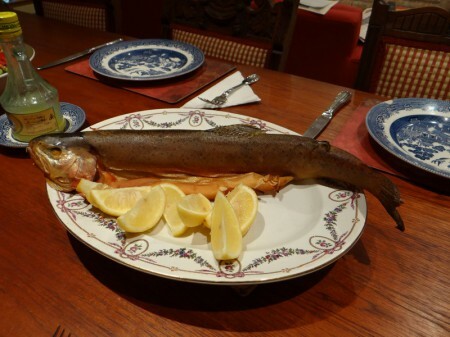 It was a beautifully colored Rainbow Trout though and the smoked fish made a delicious entrée for another one of Margaret’s awesome dinners that night. 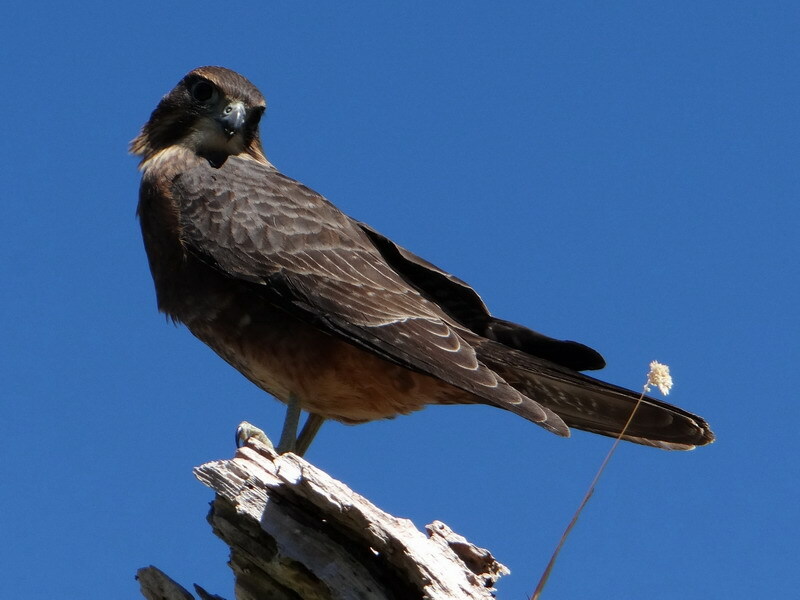 Our five days in Canberra were over far too quick and we had to say good bye to our friends. Many, many thanks for everything, we hope to see you all again soon. The drive from Canberra back to Brookvale/Sydney is very straight forward and fast, if you are prepared to pay road toll in central Sydney. We thought we can save that money by using toll free roads, which in hindsight proofed to be a bad idea. The traffic around the big city is massive any time of the day and finding our way around avoiding the main arteries was a pain and took hours. We made it eventually, arriving a little worse for wear. The last day in Sydney was filled with closing bank accounts, terminating insurance policies and packing bags. New Zealand here we come!